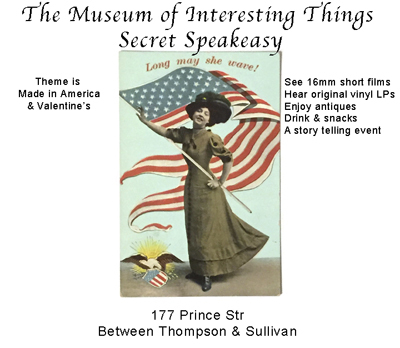 Secret Speakeasy theme is Made in America for Presidents’ Day & Valentine’s too! We will bring items from our vast collection of Made in the USA & some Valentine’s thingies too! 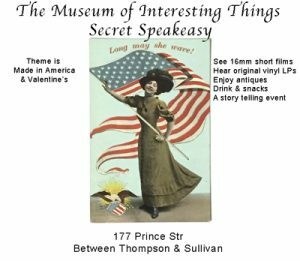 The Museum of Interesting Things takes over a Soho loft for a special 16mm short movie & music fest & party! Drinks, music, food & beautiful visuals! Also, early 1900’s Vaudeville and Jazz, stunt and circus. All eras of history some over 100 years old! The Museum has a show featuring Original Rare 16mm short films from the 1940’s, 1950’s and 1960’s and you get to pick the films allll night! Early 1900’s and some 1800’s Stereoviews and Mutoscope cards!